Bang! Boom! 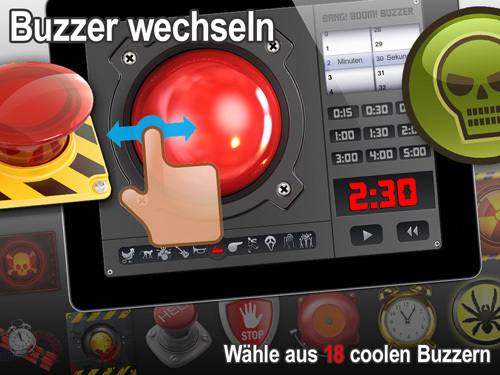 Buzzer – Der coole Timer mit Dutzenden Sounds und Buzzern (für iPad, iPhone und iPod touch). Bang! Boom! Cling! Crash! Wohooo! – Welcher Sound darf’s denn sein? 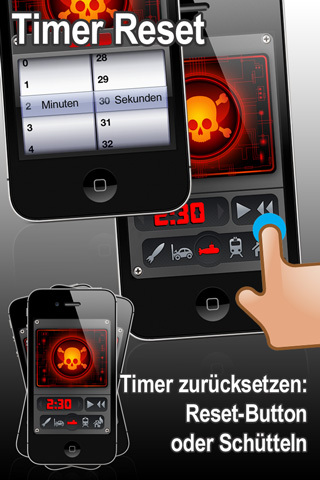 Oder welcher Buzzer? Beim „Bang! Boom! 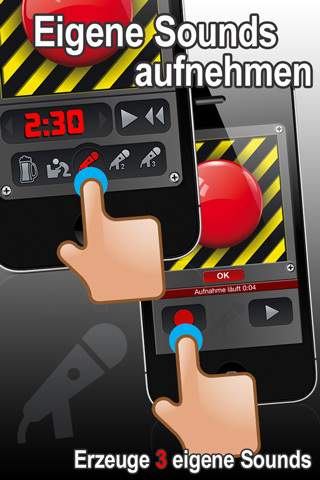 Buzzer“ entscheidest du, wie der Buzzer aussieht und welcher Sound ertönt. 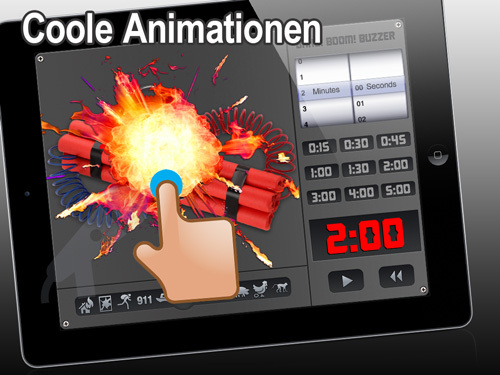 Jede Menge Buzzer und Soundeffekte stehen zur Auswahl. „BANG! BOOM! 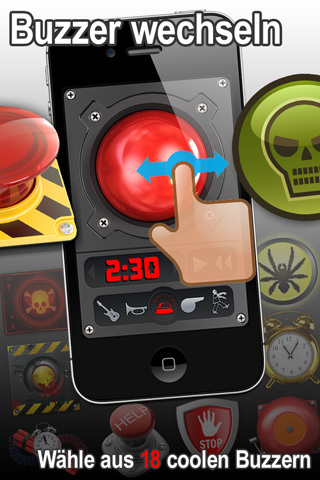 Buzzer“ ist erhältlich im App Store. I have the same problem as posted above for the Bang Buzzer App. I cannot work out how to record my own alarm recording on my ipad. I select the microphone, press the red record button and nothing seems to record. I have tried subsequently pressing the ‚play‘ button but no sound? 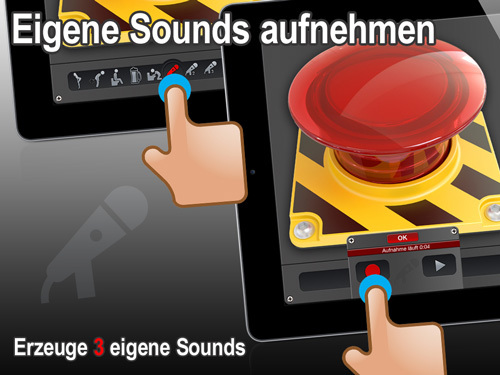 The app is enabled in the ipad settings to record (General, Privacy, Microphone and Bang Buzzer has access to the microphone). Please advise. 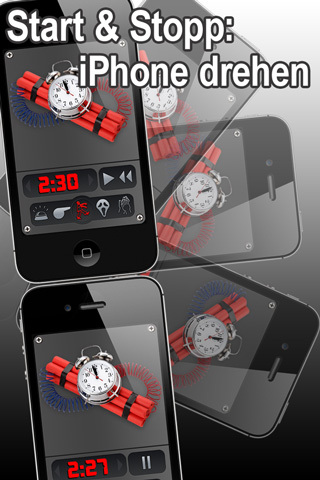 I can’t figure out how to record my own 5 second alarm recording. 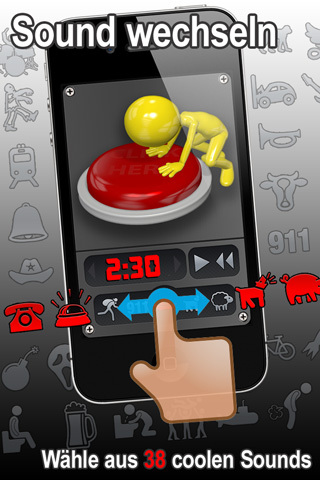 I have your app BANG Buzzer but when I put it on the microphone icon and push the red record button, it does not record.